Kyle Adams is full time faculty in the Baylor University Doctor of Physical Therapy Program. 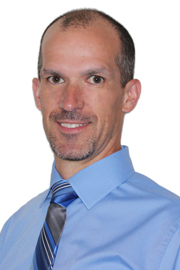 He is a Certified Strength and Conditioning Specialist (2004), board certified in Orthopaedic Physical Therapy (OCS) (2005), a Fellow of the American Academy of Orthopaedic Manual Physical Therapy (FAAOMPT) (2012), and most recently completed a Therapeutic Pain Specialist Certification Program (2017). He spent most of the past 10 years managing and practicing in a small private physical therapy practice in Upstate New York, and at SUNY Upstate Medical University’s Doctor of Physical Therapy Program in Syracuse, New York. He also served as an adjunct faculty member at South College’s Doctor of Physical Therapy Program in Knoxville, Tennessee. Dr. Adams has taught and helped create online, live courses, and educational blended learning programs over the past 7 years for Evidence in Motion, a physical therapy educational institution. He has served (2016-2017) as the Director of a Physical Therapy Spine Fellowship and Orthopedic Physical Therapy Residency in Ithaca, NY. He resides in Syracuse, NY, and enjoys spending time in the Adirondack Mountains with friends and family when not at work.